Posted by jackedavis in alums, careers in history, graduate students, Uncategorized, what can you do with a history major? The UF School of Journalism recently announced that Cynthia Barnett, who completed an MA in history at UF in 2004, will be joining its faculty this spring as a Hearst Visiting Professional. Congratulations to one of our own. The Jschool’s press release is below. 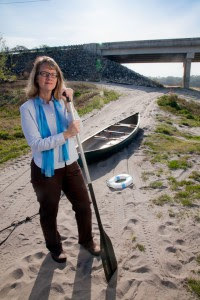 Award-winning environmental journalist and author Cynthia Barnett will join the University of Florida for 2015 as a Hearst Visiting Professional, part of the College of Journalism and Communications’ commitment to help students gain and share critical understanding of the environmental challenges of our time, including water and climate change. Barnett has covered water and climate worldwide, from epic drought in Australia to groundwater depletion in India. She will teach Environmental Journalism and other courses; work hands-on with students to cover environmental issues in Gainesville and globally; and team up across disciplines with UF faculty and students who are working to help improve public understanding of complex environmental issues. Barnett’s books are known for engaging the public as they balance hard-hitting journalism with forward-thinking solutions. Mirage: Florida and the Vanishing Water of the Eastern U.S. won the gold medal for best nonfiction in the Florida Book Awards and was named by the Tampa Bay Times as one of the top 10 books that every Floridian should read. Blue Revolution: Unmaking America’s Water Crisis was named by The Boston Globe as one of the top 10 science books of 2011.